Now that you’ve seen me without a stitch of clothing on, and facing you with the situation, I thought I’d bring you up to date about the second home of my young life. 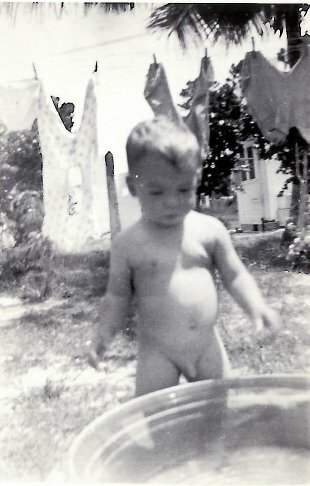 When I was only a little over a year old, my Mom, Dad, and I moved to Lake Worth, Florida. As I was much too young at the time, I have no memory of my first trip to the Land of Sunshine. My Dad worked for the city, which is a southern suburb of West Palm Beach, and my Mom had her hands full with the above illustrated hedonist. Unfortunately, my father did not have the best of times in Florida. His job was to remove the bodies of dead and rotting alligators. Now Dad had a tricksy stomach, so instead of job satisfaction, he was mostly involved in projectile vomiting at the time. The move to Florida was declared a failure, so Dad insisted that the family relocate to the Hungarian neighborhood of Cleveland, on the East Side’s Buckeye Road. Which is what we did. My third home was the second floor of a duplex at 2814 East 120th Street. I was able to put down some roots there, as we were to remain there until 1951, after my brother Dan was born. Since I didn’t know a word of English, Mom and Dad figured we should relocate to the suburbs, a few miles east of Buckeye Road. It was time for me to learn English and become a red-blooded American. Which I proceeded to do, with such dispatch that after three more years, I was no longer regarded as a problematical retard with a funny accent. BTW: My Mom adored the above picture. She showed it to all my girlfriends…. This entry was posted in personal and tagged cleveland, florida, hungarian, lake-worth. Bookmark the permalink. Your mother was right, you were a gorgeous baby. Your poor father.